I used to meal plan on paper and it took me hours to get everything picked and my grocery list done. It took a little bit of set up but it was TOTALLY worth it. Now I am not missing ingredients and it takes no time at all to plan everything and have my grocery list done. I have recommended this app to everyone I know!! I spent two and a half hours yesterday and got all of three meals input. I figured that there is a learning curve at the beginning, plus time to get it set up, so I gave it another shot today. An hour later and I am frustrated at how unwieldy this app is. It suffers from the same thing a lot of organizing apps suffer from: over complicating things in an effort to give you more. I wanted something I could simply write down what the weeks meals are. I don’t need to put down a recipe for everything. I don’t need a grocery list. I already have an app I like for that, plus putting groceries on automatically from recipes has the problem that it adds staples I keep in stock always, and doesn’t add said staples when they start to run low. The very first recipe site on the list listed on the “imports” I use, and have an account, and the app. When I tried to import my recipes the other app opened, and I lost the import interface button and couldn’t import anything. I spent a lot of time but could not figure out a way except to close the recipe app, go back to this app, individually search each recipe on their import page and import it from the site opened anonymously through their web search. This app has wasted my time. I’ll go back to scribbling the weeks meals on a calendar on the wall. It’s a lot faster, and I need fast. MealBoard Is much more polished than it was early on, and very convenient. Being able to import recipes in the iPhone and iPad apps, as well as on the computer is really nice as I almost always use my iPad in the kitchen. I find myself importing recipes that I haven’t tried yet, because they are so easy to scale. I am pleased to see the development that has occurred in the past couple of years. If you haven’t looked at it in a while, definitely take a look. I meal plan and buy all my groceries using the local online/curbside to stay in budget. I used to use other apps that just logged the meals but, this app is perfect for me. I can import my meals, add them to the calendar and also add them to my shopping list. The great thing about this app is you can see the picture to remember what meal you are making. I love it. Recently a member of my family has had to switch to a low sodium diet. This requires pretty much all home-cooked meals, since most processed foods are loaded with sodium. After taking the time to load my low sodium recipes into the app, I am now able to make one shopping trip per week with the list it generates, which frees up more time (and money) for all the other things we have to do. Eating healthy meals is much easier now. You have to spend some time at the beginning loading your recipes in, but it’s very worth it. This app is just what I needed to plan meals, add recipes, import recipes, and create a shopping list. There is so much to this App, you need to check it out. Coupons, prices, synching between devices, to Name a few. Plus excellent user support. Scam app w/ only 15 recipes! This app is a scam!! They only have 15 recipes to choose from. Not kidding!! Too bad I had to pay $3.99 to figure that out! Don’t repeat my mistake! Great app! Useful for meal planning and it’s easy to use. It would be nice to import certain stores into and you may be able to but I haven’t figured it out yet. I do know you can build the store. With the updates and the website where I can input my recipes, I give it a 5 star. I’m impressed with the design of this app but there is still work that should be done before I can recommend it. (For example, you can’t generate a grocery list that is based on what you normally stock. As far as I can tell you can’t find recipes based on what you have, either.) both features would make this awesome. Great app for a single dad! This app saves me from making processed food dinners every night for the kids. I own two cookbooks, but I love this apps ability to pull recipes from the internet, add them to your recipe box, and then put into a shopping list what you are going to make. I’m not this organized, but the fact that it also allows you to inventory your pantry is also cool. I completely could not stand using this within the first ten seconds. It over-complicates the simple desire to write out a list in a calendar and have a grocery list to the point of absurdity. It’s too bad you can’t get refunds on apps. Love this helps save me money going to the store. I've had it for 4 years now. Just take the time to do it. This is a great app to get keep track of recipes and what you’re cooking each night. MealBoard is my go-to app for planning meals. I love the shopping list feature. It’s easy to use. I wish I could just write my own shopping list and cross thing off. I love this app. It is a great tool for planning meals. Even more than I was looking for! I’ve been using this app for a little over a week, and have been busily entering recipes, doing meal planning, and using the shopping list. Haven't yet approached the pantry inventory, but may with my pantry staples. Love that I can create templates of meal plans for future use, and love that it puts my recipe ingredients on my shopping list. Yes, its work to set up. 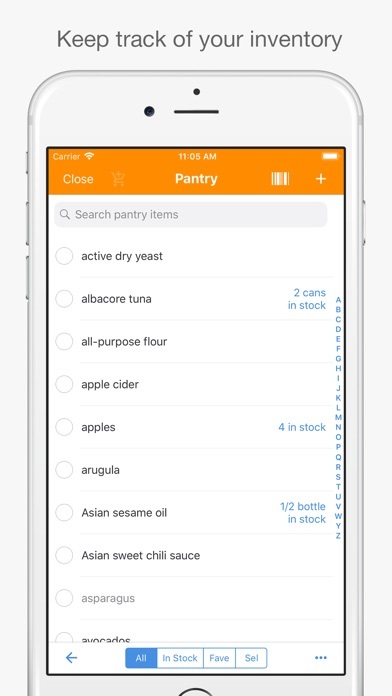 But once a recipe is entered, I can tap to add it to my calendar, and tap to create a shopping list, and tap at the store to mark the item in my grocery cart (and tap again to add to the pantry if I decide to go that far!). Over time, this app is going to save me time - just with the grocery list alone, not to mention having a plan for meals. Downloading recipes so far has been simple, with minor edits required, and love that all of it is synched between my ipad where I do the entry, and my phone where I do my shopping - not to mention having recipes with me for spur of the moment plans! I love how easy it is to use the app and how quickly I can add recipes and create meal plans. What would make this a 5-star app is a complementary desktop app, plus it would be great if the shopping list algorithm would group like items (e.g. olive oil and extra light olive oil). This would avoid what are basically duplicate items from populating the shopping list. Other than that, it really is worth every penny spent! I cannot live without this app. I have no issues with this app. Great for meal planning. I absolutely love this app! It is simple to use; it didn’t take long to upload my Pinterest recipes and now I have them at my fingertips! Thank you so much for making such a user-friendly app that makes my life so much easier! Love that i can choose meals for the week on Sunday morning and quickly identify what I need to shop for. Then when it’s time to make dinner, I just open the app and i know exactly what to do. Makes for more variety during the week because I don’t have to defer to old standbys and my family loves it. Also helps me try to have at least one vegetarian meal a week. Took a little bit of time to get recipes in the app, but it was actually fun. The importing function is incredible. I have been using MealBoard for several years and I think it works better than anything I’ve tried. The initial set up to have recipes I want is little time intensive, but it is well worth it and makes my life so much easier when it comes to meals. Thank you! I bought this to make life weekly food planning easier but this app is a pain to navigate. I wish it had a trial so I didn’t waste money on it. Hard to add recipes, hard to get the shopping list clean and easily setup, and the app is not easy to navigate. I wish I could get a refund it’s no use to me as it is. Best app for meal planning! I’ve used this app for years and absolutely love it! 98% of recipes are compatible to be directly imported in making it possible to build an extensive recipe file! I plan meals for the month and this app aggregates all my ingredients making my shopping trip simple. I will continue to spread the word! This is just the solution I was looking for! I co-own a daycare and I use this app to make my grocery list. It saves me so much time and I don’t miss anything in my order. I’m pretty impressed with this app. You can do a ton of stuff with it, but even if you’re like me and like things super simple, you can do the bare minimum and have it work exactly how you need it. I do wish you could label your own shopping lists though. If you can I haven’t figured it out yet lol. Only thing that could make it better is to connect to a grocery store! I don’t even use half the features, but it has helped me tremendously! Love this app. Especially the ability to import recipes! I can email the family what to get started cooking instead of getting home and scrounging around for dinner.i would love the ability to send the shopping list to WalMart to order my groceries for pick up then I wouldn’t have to go in that time wasting hole. Perfect for beach menu planning and shopping! Love this app for storing recipes and meal planning. The only thing I need to figure out is how to use the shopping feature. I know it is operator error because my niece showed me how to use it. Thanks for making my planning easy. I’ve just started using this app and already love it. There is so much function packed in this inexpensive app. Its well worth the cost. I’ve added my own categories and it helps me stay focused on my everyday eating goals yet keep “family favorite” foods in a separate category to use for those special occasions. The shopping list is amazing since it generates automatically and with the option to show which recipe each item is being used in, I can skip all items if some of the key items aren’t available for one of my recipes. I really love everything about this app. If you add a bookmark to your logged in Pinterest you can access all your saved recipes there and then it’s easier to import. Great app. Worth the money. I LOVE that this app offers recipe/grocery list/pricing/pantry all in one app. Best in class. Can't live without this one. Just wish thee was an android version. Seriously, I have resisted switching from iOS to android because of this app. Wish list for iOS: add tax, capture prices for different stores. I love this app! I have it on my phone, my iPad, and my husband’s phone. He loves that he can add things to the grocery list and it will sync automatically, and that he always knows what’s for dinner. I love that it keeps all my recipes and I can read them on the iPad while cooking. I also love that it’s easy to remember all the options you have for dinners when making the meal plan for the week. I even include things like “frozen pizza” and “not here for dinner” as recipes, so that we can really see every option for busy nights. I’ve emailed with the app’s developer, and he’s really open to adding in new features and making it better. He told me he’s currently working on giving the website all the features the app has, which I think will be great too! Overall, this app saves me a couple hours each week, and streamlines everything so I never forget anything at the store. Awesome!! Super easy to import any recipe! Pick days of the week, pick your recipes, it makes your shopping list for you! Saves SOOOO much time! I absolutely love this app. It is so very customizable and I’ve been importing / entering recipes for two days straight now. About 20 years ago I tried a meal planning software called MasterCook. It was great for its time, but it was so unwieldy that I soon gave up. Because of that poor experience I have avoided this type of app until now. I use it on my iPad, which means I have a beautifully laid out recipe card to follow. I love that it generates a customizable shopping list that I can send directly to my printer. I’m sure that if I were more organized I would find the pantry portion something I couldn’t live without.... but I’m not there yet. Plus, I’m 67 and if I want something from the store I simply send my husband. For some reason he enjoys getting out of the house! The other thing I just love is that for recipes that I key in myself the app lets me browse and find whatever picture I want to use. And I found some really, really nice pictures. Makes me look like a star! And, last but not least, to be able to back everything up to the cloud so I don’t lose everything the next time I drop my iPad in the pool..... perfect. So, thank you. I almost never ever pay fir an app... but this one is worth every penny. I bought this app a year or two ago and stopped using it because nothing felt right like an app should, but instead it was overwhelming. The UI is very basic (no styling) and buttons are placed everywhere. I gave the app another try today to see what has changed but very little has. I am excited for the idea of this app and features it offers but it needs some work! The auto-run tutorial gets you started meal planning with ease upon first launching the app. The menus and features are intuitive and robust. I particularly love the shopping list and pantry features. I am getting to know this app and have enjoyed it. My main goal was a good shopping list and found this app as I was testing a variety out. It gives me a good shopping list, a way to track what I eat and recipes. The recipes allow me to see what is needed for some of my favorites It will take time to get everything in. It also did a great job of keeping my data safe when I lost everything. This app has everything I need to stay organized with my family of 5, I do a lot of couponing and the pantry section is amazing for keeping track of my stockpile! Absolutely love this app well worth the money! I love how easy this app is to use across different platforms and I appreciate its flexibility. I have spent hours uploading my favorite recipes and it makes kitchen inventory a breeze - if you are willing to invest a little time (well, maybe a lot, depending upon how OCD you are!) to set it up and make it work for you, the time saved down the road - and when you are at the grocery store - is worth it! Highly recommended! I chose this app over paprika 3 because the ingredients and instructions are on the same page so I didn’t have to touch my screen while cooking and the computer version is included. I give it 3 stars because it is cumbersome to import recipes. I have to tap 10 times to get the recipe to load in the app. Would be a lot better to be able to import directly from my browser instead of bouncing between the app and browser. That would be 1 1/2 stars, the other 1/2 star would be able to choose the apps opening page. Developer touted it is customizable, but I don’t use the meal planning part. I should be able to change the start page to recipes instead of meal planning. Developers seem to have made several updates since launch and I’m hoping these 2 are in the apps future. App is great! I would like to be able to select as well as TYPE the expiration dates. Scrolling to 2021 takes longer than simply typing it in. Great app! I’ve always wanted a place to save and categorize my recipes digitally and this really does the job! Only complaint is that sometimes it doesn’t accurately load recipes from websites/blogs. But still worth the small fee! So useful and worth the money! Best app out there for importing recipes, planning meals and creating grocery lists. Cannot say enough. Just wish I could export the prices with my shopping list when I email or print out. I use the list as a master list and the total prices in cart are getting cut off at the top. I need to see for budget purposes. I’ve been using this app for years. I’m impressed that the developer has continued to update and improve the app for all this time. If you cook with Internet recipes, this is the best possible way I’ve found to keep them all in one place. The import feature is easier to use than ever. You can search recipes by name and ingredient and import the ingredients into a shopping list (which can be organized by section of the grocery store). It’s easy to share a recipe with a friend. There are so many wonderful recipes that I would have lost if it weren’t for this app. So much better than the recipe boxes and binders of yore. Love the ability to import recipes from a variety of websites and to put them in my cart. Sometimes the display isn’t clear on quantities (I.e., it will just say “chicken” instead of “frozen chicken breast”), or it miscategorizes items (garlic in the frozen foods section? ), but overall a great tool and very easy to use. Love the online import option. I can add recipes from all over the web right from my PC. I’ve spent the last day or so planning meals for my Trim Healthy Mama diet and I am amazed at the ease of use and organization with this app. Thanks so much Ray!! Rice at one store is on aisle 12, at another store it is on aisle 7. This app has an “aisle” feature, but it doesn’t allow you to assign different aisles for different stores. Ray, can you please remove the ad bar from the meal board app when browsing for recipes to import? It’s beyond annoying and makes pages freeze and slow down. If you implement a fix ill redo the review. I already paid for the app the ads aren’t necessary. The recipe import function doesn’t work as well as I’d hoped. If the recipe comes from a blog it tends to grab non-recipe narrative and messes up the ingredients/measures on occasion. Other times you need to manually select each thing you want added to the recipe, essentially making it a manual entry. The app also erased my numerous imported recipes. Cool concept though. I really like it as a way to collect my recipes. One of my favorite features is that it stays on while I am cooking so I don’t have to constantly touch my phone. I’m still figuring out to use it for shopping and planning, but it has been worth the buy so far. If you are like me, you have a hard time meal planning and shopping for the week. This app is perfect for doing that! Also recipe importing from a lot of great websites is seamless. I don’t think I’ve ever written a review for an app. This one does all that I need it to do. I was using a spreadsheet for pantry inventory, bookmarking online recipes, using Word to type them up, using Wunderlist for my grocery list and putting menus on my calendar. This does all of that in one app and works very well. I especially like the feature where I can take all those bookmarked recipes and import them into the app. Best Meal planning and grocery list app out there!! I have used mealboard for several years now and it is my favorite. I love the import recipe feature! Keeps my recipe addiction organized and my family happy with all the great food I make for them. Thanks mealboard for being amazing! I have been looking for a log time for an app just like this and now I’ve found it! I keep all of my recipes stored in the app and adding recipes is fairly quick and easy - especially with the import option. I love that it makes my grocery list for me and adjusts according to how many servings I need to make. The app has great recipe storage, meal planning, and shopping lists. I love how easily I can upload recipes from most web sites. The “add meals to my calendar” feature is a great touch. The app is sturdy and reliable. I could have given it five stars, except that I am hoping that one day it will auto-incorporate prices for items at common stores near me. Then the app would be perfect. This app is amazing. Some users have complained about how complex it is - the complexity is one of the main reasons I love it so much. Don’t confuse complexity with hard to use, though. This app is very thorough, which allows for very a very flexible and power user experience. One of my favorite features is the ability to import recipes. Though it doesn’t work on every site, I’ve found it to be very reliable on a whole lot of them. On sites that it doesn’t support you can copy the recipe and paste it into the web interface, and that works really well. The pantry feature is also amazing. Once your kitchen is input into it, you can quickly see what recipes you can make, and make a shopping list out of whatever you’re missing. Highly recommended! Well worth the cost!! MealBoard is exactly what I was looking for in a meal planning app. You can import recipes from other sites, or you can enter your own recipes. 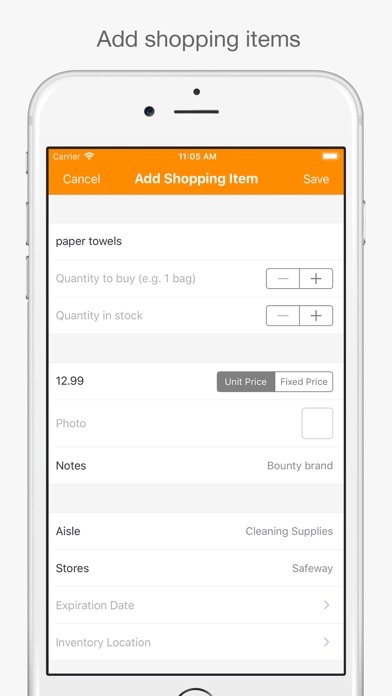 The shopping list allows you to add items to it, and you have the flexibility to update the store isle if needed. This is the best meal planner app that I have seen. You plan your meals, tell it what ingredients you need for each recipe, generate a shopping list that you can check off on your phone or print out, and track your pantry. It even tells you how long it has been since you used a recipe within two months. Best of all on most recipe sites you can auto import recipes. I have used three different apps for meal planning, shopping and sticking to my grocery budget. This bad boy does it all!! It takes a bit to import all of the recipes I use but since I have several Pinterest boards where they are all organized, I just add the ones I know I’m going to use for my weekly menu and add more as needed. Super simple. Thanks for creating a great app for those of us who want one stop shopping! as a busy mom, one thing I hate doing is trying to come up with meals all week. I absolutely love this app. It makes it so incredibly easy to organize everything. It’s streamlines the whole grocery list process and makes it incredibly easy to do meal planning for a whole month at a time. I have nothing bad to say about this app. The Best to keep track. I’ve tried several others & found this to be the best. It’s saved me a lot of money. I especially love having meal planning & grocery list. This app has literally replaced 4 other apps. It’s fully customizable and so easy to use! This app has 15 recipes. I will request a refund because MealTime gives you hundreds for free. You’ll need to spend one timing setting up your recipes but the app makes it really easy to import recipes or add new ones. Really handy features like managing pantry and shopping lists make this much more than a meal planner. I’ve been looking for an app as easy to use as this one for the longest time! Totally worth paying for. Do yourself a favor, if you’re as unorganized about meal planning as I am. This app makes it to easy!! The price of food does not come over. I understand god costs change frequently, so this can be difficult. I was hoping I could set a budget and it would provide me with recipes I could make within that budget . Great Meal Planning and Grocery list generator! I use it daily!! Would absolutely love if the next update made the app Apple Watch compatible!!! I hope the developer keeps updating this app for years to come. It’s without a doubt the app I use the most on my phone. Perfect for storing recipes, importing new one seamlessly, creating meal plans AND shopping lists assigned to different stores. Can’t recommend it enough. I’m not sure how I lived without this app before. I can import all of the recipes I use (or manually enter them) & the app generates a grocery list based on the recipes I chose for the week. It’s amazing & a HUGE time saver. I’ve been using it for over 2 years and couldn’t be happier! Used this app for about 6 months now - very few issues- and only minor ones. Takes a bit to learn it (still not using it fully) but well worth it. We have saved far more than the app cost in not throwing out spoiled food. I love using this to plan out my meals for the week as I am on a strict diet, but I have to keep a separate list to track the nutrition. If the recipe population page had an option to add in the nutrition info it would make my life easier. Otherwise this app is great. Really easy to get a grocery list/follow recipes on cooking days. I’ve been using it for years now. The best meal planning app ever! Easy to import recipes, Make menus, And then automatically create the shopping list! Syncs across devices automatically - so my husband can pick up needed groceries from his list when he is out. Love that I can plan menus, add recipes from a number of places including my favorite paleo site or Pinterest. Then I can easily put ingredients I need right on the shopping list. I even added errands as one of my stores so I have a list of where I need to stop. Fabulous. Import recipes from multiple sites, choose your meal, automatically generate your shopping list — it combines the functions of several apps in one. Not utilizing fully but it has great potentials. Typing in recipes is cumbersome. Must be a better way. I’ve only been using this app for about a week and so far I’m totally hooked! It does everything it promises and more. And unlike the other ones I tested, it’s a reasonable one-time cost vs a monthly fee. It does take some time initially to import all your favorite recipes from the internet but that’s a one time deal. It’s completely customizable from meal categories to stores you like to shop at, everything! If you REALLY want to use it to it’s full potential you can go through and inventory your entire pantry but that would take weeks in my case. Not to mention I don’t always use recipes and when I do I’m really bad about improvising them so it would’ve be very accurate. It does populate shopping lists based on your scheduled meal plans and inventory. You can then easily edit your list based on what you actually need. So far, I love it! Already stopped using the other shared shopping list. To use on more than one device, just use same login and sync. Super easy and user friendly. LOVE this app. I am able to meal plan on both iPhone and iPad and have them sync automatically with each other. I love how easily it creates shopping lists. The only thing I would like added is the ability to import nutritional information with recipes. My daughter is diabetic and I currently have to follow the link to the recipe website to get carb information. I am basically computer illiterate. The nice people behind the scenes at this app pushed me through like I was 5 years old. I like having my recipes with me when I’m visiting my son and when I’m at the store to make sure I have every little ingredient. I use MealBoard on a daily basis. Best meal planning and grocery shopping app I’ve found. This app is just what I have been wishing for! I’m excited to invest some time in growing my recipe list and setting up meal plan templates! I love that it syncs with my calendar. I can track prices too. I love this app!!! Thank you so much! I love this app! I am on a a very strict Autoimmune Protocol diet and this app allows me to import recipes from all the websites that post recipes as long as they are in the right format. And even though it’s not one of the listed websites, I can even go to Pinterest and import all the recipes I have gathered! 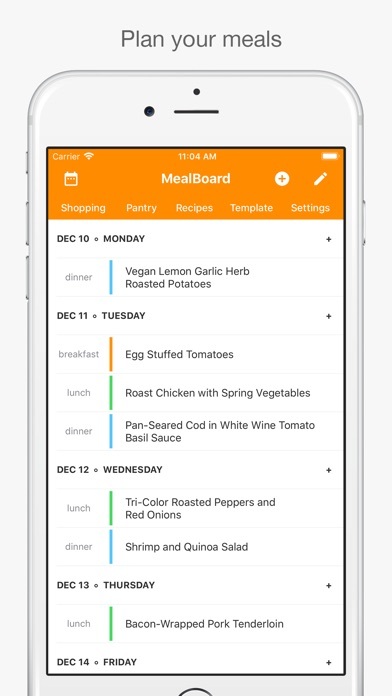 Meal planning and grocery shopping has become a breeze thanks to MealBoard!! Love this app. I had trouble w it at first but Ray was quick to respond and was able to fix it for me. The app is super easy to use and I’m definitely cooking better now that I’ve got it. Shopping is easier too. I really and truly stink making meal plans and grocery lists. This app makes it super simple. I heard about the app through my chiropractor as his family uses it all the time. Can’t import recipes from any website. -90+ Pounds w/ Meal Planning! One key to weight loss is having a plan. MealBoard makes it super easy for me to keep track of recipes! I add calorie counts to recipe titles so I can easily pick what works for my daily calorie needs. I can’t say enough about how much this helps me stay on track. So easy to use! Help’s keep my busy family well fed! Now I know where things are and how much I have in stock! Makes meal planning a breeze! I would give 6 stars if I could! Works well for me. I’m happy that there’s an online input option. Much easier than on the phone. I’m so happy with this app. You can import recipes from so many different websites- my favorite is skinny taste. The app then creates a shopping list for you! The shopping list is easy to use. There is also a pantry inventory option but I haven’t been ambitious enough to use it yet. You can also sync with other devices and other family member’s devices. Pretty darn great. I have been using this planner for a couple of weeks now and so far I love everything about it. Most of these types of apps take a little bit of work on the front end but it’s well worth it on the back end. It allows me to include recipes try them and then delete them if we didn’t like them, and if we did then I have them to use over and over again. This app has a feature to list all the items you have in your pantry. It also features a meal plan for a week or a month. I like the grocery list feature. It can be emailed to your spouse for easy pickup of items you need. I like the recipe feature as well. You can import recipes from the web. You can choose from chefs like Alton Brown, Bobby Flay, Ina Garten, and many more from the Food Network website. You can also find gluten free, paleo, vegan, or vegetarian recipes. This has been a good purchase for me. Gets better all the time!! I have been using this app for years and years now, and it keeps getting better. It used to be a little bit of a pain to enter my recipes. Not hard, really, but time-consuming. It was always worth it once they were entered, but still took time. But the developer has worked hard at getting more and more websites in the “import recipes” section of the app, and it’s amazing how many sites are there now. So now it’s rare that I have to enter my own recipes. I have been able to import so many so easily from my favorite cooking websites. Now when someone gives me a recipe to try, if they tell me where they got it from, I go into my MealBoard app and the Recipes tab and go to the appropriate website and search for it. Once I find it, I tap “Import Recipe” at the bottom. Then all I have to do is look through the ingredients to put them in the correct aisle of the grocery store. I also look over the directions because sometimes there’s a little formatting that didn’t work so well so I will make it look nice by taking out any unnecessary characters or adding or deleting extra space. Then I hit Save and it’s in there, ready to be added to my meal plan. There’s even a notification part of the recipe where if I want to be notified the day before, for example, to thaw something, I can set that. It is also extremely easy to share a recipe when a friend asks for it. It can be emailed easily from the app. I just love the app and I love how it keeps improving all the time. I recommend it to everyone. My wife and I have been looking for a good meal plan app that doesn’t overcomplicate things to the point of being non functional. This one is pretty much spot on. I’ll update this once we’ve been using it consistently for a longer period. Update: we’re still really loving this app for managing our groceries and meals. The more you get used to using it, the easier it gets and the more functional it becomes. Great work Ray! Recipes and ingredients lists extremely limited. I couldn’t make it work for me. :/ good idea in theory though. I now love to cook! I dreaded dinner time for years and a lot of times avoided it altogether because I had so little imagination for planning meals. And when I thought of something, I wouldn’t have all the ingredients. Now I load and categorize my own recipes as well as imported ones, pull together meals by using those categories, add the ingredients to the grocery list and and follow my meal plan. At the touch of a button, I can view the whole week and no more thinking about it. Love it. I love this app so much! It’s totally worth the money. I am able to import all the recipes that I want. And it is so easy to put the ingredients in a grocery list. It has been saving me time and money! The app is great and does have a lot of detail to what you can do: add pictures of meals, import recipes through SOME popular websites, pantry inventory, recipe categorization, grocery list assembly...etc. However it takes a very long time to import your own recipe let alone compile a bunch of them if you are not able to directly import it from a website. Also the subcategory headings capability would allow me to make multiple headings for the ingredients section but I was only able to place my ingredients under one heading. So, my ingredients for the sauce would go under the main ingredients as well. Helps us (indirectly) to lose weight. We use MealBoard on one iPhone and two iPads. Having so many options for sharing allows the two of as to coordinate (as a couple) and see the meal plan as it fits into our schedules. I am a big fan of the app, I love the pantry function and the ease of creating a grocery list. Being able to edit the categories and the aisles to the ones that I prefer is a big plus for me. I love how they’ve kept it simple and somewhat "text" oriented rather than "graphics" oriented. I don't need for it to be fancy, I just need for it to work! And it does! I had gone away from the routine of meal planning for quite a while and am returning to having it in my weekly approach. What I have found, by using MealBoard over the years, is that it helps me to more successfully work my WeightWatchers program. It was fun to fire-up MealBoard once again in tandem with my return to WeightWatchers. Not only is this the best meal planning app available, but customer service is outstanding. My desire to import recipes from my favorite web site "cooks illustrated " was realized within hours of writing a request to support. I don't write reviews but it's really my only way to show my gratitude. I have a memory problem and I would be lost with out this. As long as you keep it updated it is a wonderful time and money saver! And I don't do reviews! This is a first—but this app is really amazing. I selected it following research a couple of years ago for my wife thinking it would be "kinda nice." My wife is super organized, loves her recipes, really cares about her meal planning and has a demanding full time career as a an Psychiatric APRN. I do most of the actual grocery shopping. Wow—she really got serious about using Mealboard and it has amazed me how useful it is. Really exceeded my expectations. She has learned more and more and has a great data base now. We sync with my our iPhones and iPads. I can not imagine going shopping without using this app now. All our married kids now use it. It was really great for them to be able to log in on "moms" account - do a sync- and immediately get all of her data as a beginning base and then they all continued to modify their own apps on their own after that. Now they all swap and share recipes. When I help out with cooking (not one of my strong points) I'd be lost without Mealboard. So we always cook and shop with our iphone or iPad as the main control center. It takes a little learning curve but the effort you put in returns much more benefits. She can plan out cabin trip menus and gathering menus and just everyday menus and shopping lists really fast. I'm very impressed. It's been a blessing for us. I highly recommend it!! Well worth it!! Keep up the great job. This app has helped me finally start planning meals ahead of time! I like the template feature and have been spending less money on groceries. I like this app because it allows you to import your favorite recipes from the Internet and save them. I also like the shopping list feature because while in the grocery store, I can check off the items in my cart. When I get home, I can save my ingredients to my pantry. When I used this app consistently for two weeks, I did not repeat a meal! If you want to try something different than the same old dinners you cook every week, then give this app a try. It does involve some planning time to import your meals, but it is worth it in the end!! I just got this app and I’m already in heaven. I’m a busy college student who is trying to save money and making home cooked meals is the best way to do it. I went through majority of my Pinterest saved meals and imported the recipes. I even put these into categories so I can sort through my meals easier. I LOVE that it makes my grocery list for me! Now I can print these out or post them in my notes and my life is so much easier! Day one of this app and I highly recommend it! I have input tons of recipes and use this daily. I love it. I love that I can include or exclude any ingredients in my grocery list. My kids sometimes ask me for a recipe and I can email it to them right away. I love how I can plan my meals around our schedule and create my grocery list from them. Makes my crazy, busy, chaotic family life somewhat organized and we have had a home cooked dinner every night since we started using this app. Thank you for providing something so easy. My husband loves that I can easily import the recipes he finds into here and schedule when we will have it. My 13 yr old and 9 yr old have also found recipes and made dinner for the family using this. It was so easy for them to read. I've been using this app for many years now and still love it! Very helpful and easy to use! I LOVE the import features and how easy it is to share recipes. This is a must have app for me! Loved it until it stopped working on my MacBook. Now I can’t add any ingredient lists but instead have to enter each ingredient individually. This was supposed to save time. Ugh! I’ve been using MealBoard for about a month now and am really loving it! I love the response time from Ray when I can’t figure something out or have a question! Great job! I like that I can import recipes and easily add them to my shopping list and they will transfer to my pantry. As I build my recipe collection it only gets easier and easier. Well worth the cost for me. This would be so much better if it could sync with grocery store apps for pricing/shopping list. This app is so manual and takes to much time to plan. Waste of money. Maybe if it was free I wouldn’t mind so much. MealBoard, where have you been all my life? I have been looking for an app like this forever! It does everything I could ask for. Store and categorize my recipes easily and with customization, plan meals on a calendar and daily move them around, grocery list, sync iPad and phone...it even syncs with my calendar so I can see what’s on the plan as I plan my day. I just love it! If you like to cook and are a planner type person...this app is fantastic. It might seems it takes some time to add all your recipes and you might say not worth it. After the first recipe you add you can see actually is not that big of a hassle. It’s all yours the way you like your dish, the perfect size you need for your family. Once you have all the info in you’ll wonder how you didn’t use this app before. Love how you can see your recipes in full screen as well. Thank You for creating this app! It does 4 things well -- recipes, meal planning, shopping list and pantry list. Easy to use. Using this app is fun! I can’t say enough good things about this app. Easy to use, and is a life saver. At first I was intimidated by putting all my old recipes in here but I just did it gradually week by week and it’s been totally fine. LOVE it! I’ve tried them all but Meal Board has no equal. It is the most perfect meal planner/recipe organizing/shopping list app ever created and more - sooooo much more! Serious life hack and life saver. I can’t praise it enough. I know what I’m going to cook. I know when I’m going to cook it. I know what I have to buy. I know where to buy it and how much it’s going to cost. EXTREMELY PLEASED! I like using this app to do my meal planning/shopping. But to me it’s easiest to upload recipes from the desktop website. Easy user interface but needs more recipes and variety. Not worth the cost of the app yet. Description oversells what you actually get in return. I discovered the MealBoard a few years ago while I was looking for an app to make shopping lists. I had no idea I would find an app that manages my cupboards, recipes, shopping lists and syncs them all together. This is an incredible useful app! It’s worth the front end work that it takes to set it up. Most versatile food management app I have found! I have always had a hard time with all aspects of food management (with the exception of eating it... Lol!) Maintaining an inventory list so I don't double-buy, making a shopping list that actually has the things I need on it and having a plan of what meals to use the groceries for once I get them home...i have struggled with these all my adult life. Drives my husband crazy! Me too! This app has ma add all the difference. You have to dedicate some time to setting it up and tweaking it to fit your needs but it is so worth it! And the taking can be done as you go along... Nothing is set in stone. Love it! **Update: For those of you on the fence about purchasing this app, the developer’s response to my initial review should confirm what I and many others have said: this app is (unfortunately) overwrought and unnecessarily complicated, and, sooner or later, there’s really no way around that, even if you just want to use basic features. So I “specified 3 dozen eggs as the quantity to buy in my pantry list?” I have never once used the pantry feature of this app, simply because I don’t need yet another list to update every time I shop or someone takes a can out of the cupboard. As you can see, even a basic task like adding a dozen eggs to a shopping cart requires visiting multiple screens, updating quantities, selecting categories and aisles and a host of other steps in order to get it right. As for the battery issue, I have checked multiple times and the statistics on my phone do, indeed, show that Mealboard is using a substantial amount my battery life every time the app is open. In summary, if you want to spend time making shopping lists and micromanaging every aspect of your kitchen stock, this app will fit the bill. Seriously, you’ll love it. (Be ready to invest some serious time learning all its idiosyncrasies and customizing settings for your needs though.) If, like me, you are looking for an app that will simplify your already busy life and allow you to easily coordinate some of life’s most mundane and rudimentary tasks with your partner or roommates, this is probably not it. Take it from someone who has given Mealboard an honest effort over the course of more than two years, always thinking that it would somehow get easier once all my categories, shopping aisles, lists, recipes, calendars, quantities, etc. were set up. This app is not a time saver. ————————————— I have used Mealboard for quite some time. There are some things I love about it and, unfortunately, many others that I absolutely do not! The fact is, though, that few meal planning apps have the features that are important to me, so I stick with Mealboard, even though there are times when it makes me want to throw my phone. The great part about Mealboard is that it lets you import recipes from all over the Internet and transfer the ingredients in the recipes you plan for the week directly to your shopping list. Now for the cons: 1. Basic tasks can often be clunky and effortful. If I bought three dozen eggs last week, and I add eggs to my list again this week, it automatically puts three dozen on again. That memory feature is nice for things I buy in the same quantities each time I shop, but when I don’t, I have to manually scroll through my entire list of groceries in order to see the amount listed and change it. Very tedious! 2. The app likes to feast on battery life (to the tune of 70% or more of my phone’s juice just in the hour during which I am using it while shopping) 3. My husband and I share the shopping duties, but lately, the app has not been syncing properly between our phones. That means we often need to make multiple trips to the store each week to pick up items we missed because the app didn’t sync them. 4. We need a way to delete extraneous food entries. Thanks mainly to my many imported recipes, I have, to use one example, about 150 different versions of skinless chicken breasts on my list. From abbreviations (chix breast), to misspellings of various types (skinlesss chickens brest), to different ways of cataloging (chicken, breast, skinless). I realize that imported recipes will continue to add these variations, but could I at least have the ability to clean up my own list so I don’t have to scroll endlessly each time I want to add an item to my list. There are other features (the pantry, for instance) that I simply do not use because they are too cumbersome. I get that the developers want to provide options, but too many options often leads to an overly complicated app. I think that’s Mealboard’s main downfall. My fave recipe app! But lately I’m having some issues importing recipes. Was this due to an update, perhaps? I would highly recommend this application because of its ability to import recipes, plan meals, shopping lists, and backup and sync in the cloud. It can also publish your meals you planed for the week or month to your calendar. Simply amazing. My husband and I use this app daily and have for the past 6 or 7+ years. We are so thankful that the developer has continued to support MealBoard and have seen it evolve into an amazingly essential app through all its updates. I’ve been considering moving toward an android phone, but have determined that we just cannot replicate or do without MealBoard. For anyone who is looking for a way to save time, to centrally store their own recipes or import from online, aggregate and manage their shopping list, and synch between people - this is it. It is worth far, far more than the price! I’ve had this app for over a year... maybe over two years??? Can’t remember exactly when I downloaded it but love it. I have imported over 800+ recipes (no, I haven’t tried them all yet, there are an embarrassingly high number of dessert ones in there) Pros: *** I can put one recipe in numerous categories, making my narrowing down process quicker. *** I’m a more frugal and efficient shopper with the grocery list. *** Having the website link on the recipe makes it so easy when someone asks for the recipe (although you can email it too). I usually have to screenshot it because I typically alter the original. These are just a few of the pros, I could be setting here, typing all day, if I tried to list them all. Cons: Not many of these, but the only reason I didn’t give the app a perfect 5 stars and it wouldn’t let me give it 4.5. *** Originally, you could have the item price on each one of your grocery list items. I forget which update did away with that, but as a single mom, I greatly miss it. I tried moving on to other apps but it was just too much trouble, so I came back. *** It doesn’t communicate with Alexa (or Siri)... if this could be addressed, that would be sublime. All in all, a great app, one that’s on the first screen of my phone. I’ve been using MealBoard daily for several years. This is my favorite app on my phone. While it comes with recipes, I entered all my own recipes and it was worth the time spent. I add recipes I want to make for the week, sync with my grocery list, and use the grocery list while shopping, checking off items I put in my cart. Sometimes, I stop at a grocery store without a shopping list prepared and add meals while there onto the meal calendar and sync with my grocery list and I’m all organized. No more forgetting what is in a recipe or forgetting to buy certain items. I can also email the shopping list to another family member to shop for me. If I want to text a shopping list, I just copy it from the email into a text. Each day, I can look at the calendar and see what I had planned to make, and then view the recipe for ingredients and directions. No need to pull out the cook book. This is also handy when I’m cooking on vacation or at someone else’s home. I can also easily edit the recipe to add important tips I discover as I’m preparing it. If I want to share recipes with friends, I can email them right from the app. If I want to print a recipe so my child can make it without looking at my phone, I can do that right from the app as well. I absolutely love this app! I’ve been using this app for years. Last year, I switched over to Paprika (and paid out the nose for it). I used it for a while but ended up coming back to MealBoard. Wasted money, but MealBoard is more intuitive and is just better. Ray keeps setting the meal planner app bar higher with every update. We have been using this app for 5-6 years now. We sync it between 2 iPhones and 1 iPad. My husband can pick up items in the store while I am collecting other items. At home preparing multiple items from recipes, I can multitask 2 recipes while my husband follows a 3rd recipe. We can immediately adjust a recipe for high altitude, scale recipes, add notes to remind me to start something at a specific time and countless other things. If trying to decide on which app to get for meal planning, spend the money and get this one! The developer is the bomb! He sets a high bar for any other app developers! Reported an issue with the iPad app after the latest update and he responded almost immediately. A few hours later, he even let me know he found the problem and an update was issued! More to love! With newest update, if for some reason I need to print a recipe, I can now do it without having to email it to myself. Just have to add a note that it is wonderful being able to immediately email a recipe to a friend who asks me to write down a recipe for some yummy item. Couple taps later I can say it's in your email. Even my notes to adjust the recipe for altitude go with it. Love this app. Especially being able to import recipes or input them, plus syncing across all of our devices! Have even used it on my iPod, to follow recipes while in the backcountry on canoe camp trips! No wifi out there, so being able to use it standalone is a plus. Also saves trying to pack slips of paper or write recipes on baggies full of meal ingredients. I can add my own notes to the recipes and scaling down to 2 servings is fantastic. We have hardly any waste these days. Menu planning is easy these days...unless I get sidetracked into the dark playground of surfing recipes ;) Ditto preparing a shopping list after rearranging the categories for the store we use most often. Support was very prompt for the one and only problem with a syncing error after nearly a year of using the program. In the middle of the nite on a weekend! Been using this app for years and it just keeps getting better! Syncs across devices, allows easy import from most web pages, can attach pictures, easily share or print. Allows recipe organization into categories and meal planning in a calendar. Highly recommend this app! Be sure to log-in to the website once you've synced. This is where you can modify and import recipes from Epicurious and other on-line recipe sites. Easier recipe entry there than via iphone. It's very easy to make out a weeks menu plan and aggregate all the shopping. I love that you see a list of what you need from the store and also a list of what you have at home. This helps when i'm cooking at a friends and need to pull from home stores. I really liked the sample of recipes they've already loaded on the app also. And the ability to email menus and email shopping lists is very handy. Well worth the cost for me. This app is saving me lots of time and we're eating much better, it's fabulous. New to the app but I’m impressed! This app is really helpful when planning dinner parties or other meals. I recommend it to anyone who wants to get organized and save time in planning and executing meals. I really like how easy it is to import recipes and search for new foods. This app finally does the job of consolidating your digital recipe book with a weekly meal calendar and an organized shopping list. It took me a while to get to a point where using this app was quick and efficient, but it was worth the investment of time to import and organize. Best to use the app on a tablet for a more seamless experience. For most of the reviewers who are unhappy... it seems either they do not understand how to use the app or they are expecting it to be ready to use. Once you learn how to use the app and spend a little time importing your favorite recipes... the whole meal planning process can be done in moments including a shopping list. Every recipe you add builds your library and you simply reuse them for even faster planning next time. Each time I think this app cannot get much better... an update comes and makes it even better. I do not know how they are able to make such thoughtful improvements and do so flawlessly. I LOVE this app. It helps organize every aspect of my meal planning from my recipes, pantry inventory and grocery list based on those planned meals. A dreaded chore becomes organized and fun. I am still learning things that the app does that I have not yet used. My only complaint is the scaled amounts are often odd measures that I would need to convert but I imagine that some recipes would make it difficult to scale. MealBoard is worth every penny and will save you both time and money! Thank you MealBoard! I changed my email address and now I can’t email grocery lists. There is nothing in settings that will let me register my email. I have used MealBoard for years and this app has worked flawlessly and has never let me down. I have set it up so that data is synced between my iPhone, my wife's iPhone and her iPad. She creates the meal plan and groceries, and I do most of the shopping. Very convenient for her (!) and it saves us so much time as we both work. We also use the pantry feature to manage our inventory. II helps us avoid food wastage as you buy only the things that you really need. This app is truly an all-in-one app I can't imagine living without it! It's intuitive, efficient to use and works very well. Hands down this is the most useful app I have on my phone. I use it every week to meal plan and grocery shop. It is incredibly well-designed and I would have paid 10x the price to download it! I had been trying to create an excel file with all of these functions, and I am so happy to see that this app has all of the things in one place. I love that you can import recipes from all over the web, make a shopping list that combines your meal plan in one quick sync, and categorize everything. It is an awesome app. One small thing: when importing, the browser is slower than other browsers and I wish I could swipe to go back a page like I can on Safari. I hope future updates will improve the browser. Super organized, easy to use. Best app out there for importing recipes, planning meals and creating grocery lists. Cannot say enough. This app is the perfect mix of elegant design and intense customization options. It’s so nice to import s recipe from wherever, scale it to the serving size you want (obsessed w this feature), and it’ll create grocery lists and even export your meal plan to iCal. I’ve never felt compelled to rate an app before but this is a reeeeeally good one!!! Take the time to play with the features, it’s so easy once you figure it out! I’ve been using this app for about a month, and I like it because it is super easy to import and tweak recipes, and also easy to add my own, handwritten by Mom and Grandma from years ago. I must admit that I haven’t started using the meal planning and grocery list yet, so I may be revising my review in the months to come. Love Love LOVE!!!!!! This app! It is revolutionizing my meal planning! I especially love that I can import my favorite healthy recipes in off my favorite websites. Saves me so much time. Of course I also like that I can add my own or old family recipes. Populates my a grocery list, that's me add the recipes to my weekly meal plan, then it remove the groceries items from the pantry when I make a recipe. Just can't get over how much I seriously Love this app! 1. It would help if we could share recipes on Pinterest to brag to our friends about what a great app this is. It's also free advertising for this app. 2. Additionally, when you go to move items from your shopping list to the pantry you have to click on a trashcan icon. This confused me for a while and I thought that the app did not move shopping list items to the pantry. I stopped using the app for a long time until I discovered the move to pantry option I was searching for was in the trashcan... It would be less confusing if you change the trash can icon or make two separate icons for deletion (trash can) and for groceries being moved to the pantry (maybe a door). Just a suggestion :) Thank you for creating this awesome app! Overall, very well thought out. I find myself using it more and more. Love the recipe import from website feature. 1. It would help if we could share recipes on Pinterest to brag to our friends about what a great app this is. It's also free advertising for this app. 2. Additionally, when you go to move items from your shopping list to the pantry you have to click on a trashcan icon. This confused me for a while and I thought that the app did not move shopping list items to the pantry. I stopped using the app for a long time until I discovered the move to pantry option I was searching for was in the trashcan... It would be less confusing if you change the trash can icon or make two separate icons for deletion (trash can) and for groceries being moved to the pantry (maybe a door). Just a suggestion :) Thank you for creating this awesome app! I only downloaded this app because I wanted the convenience of not only aggregated shopping list but auto pricing in which this app does not have available. I can look up recipes and add them to my Walmart app to see a total. I was hoping this app would automatically tell me the prices not force me to manually input each price for each grocery item. Too much work. I was also disappointed in the amount of recipes available without me having to import more. A whopping 18 and only 3 were vegetarian. I specially need vegan and gluten free so all my recipes I had to search for and import. By the end of this experience, I did everything I am already doing before the use of this app... looking up recipes, importing them, looking up prices per item, inputting them. Took hours of time that shouldn’t have been necessary. This app was useless to me. I’ve never paid for an app or rated one, but this is totally worth it. I used to use a spreadsheet for meal planning and a to-do app to organize my my grocery list by aisle. I figured there had to be something more efficient and I am so happy I searched and found this app. There’s a bit of a learning curve and it takes a while to set this up with your grocery store aisles and recipes, but once you do it’s very quick to plan your meals and efficiently shop. My only suggestion would be to have a desktop version that syncs to the app so that I can plan meals on the computer but then automatically have my shopping list on my phone. Also, I moved and my new Publix has different aisles which was a pain to switch, but again totally worth it now that’s I set it up to match the new store. Great vision with this app, it is very well thought out and makes meal planning and grocery shopping a breeze. The only feature I don’t use is the inventory feature. I think it would be way too tedious to keep track of. I use this app many times a day and love it. I love how it seamlessly puts my shopping list together so I can check what I have in my pantry before leaving for the store. I also love that my recipes are all in the same place so I can look at my planned meal for the day and then click right to the recipe. So glad I found this! All I can say is WOW! Genius and so helpful. This would be an awesome app however there are only 21 recipes loaded for selection. It takes time to load recipes but it’s so easy to do. Once they are all on there planning weekly meals will take no time at all. Love that the meals load into my calendar and that the recipes are easily accessible when it’s time to cook dinner. In the month I’ve been using Meal Board I’ve gone from serving the same 8 recipes over and over to at least 5 new recipes every week. I’ve stopped making more than 1 trip to the grocery a week. Dinner isn’t late anymore. No more impulse trips out to eat. The best part is my husband said “Wow, you’ve really turned into Super Mom!” 🤩! Only thing I would like is an option to print out your recipes. I’d like to have nice formatted recipe card to cook from. I’ve tried to make this app work for me multiple times now, and the end result is that it always ends up deleted. While the concept is solid, the app itself is overly complicated, clunky, and extraordinarily time consuming. In the amount of time it took to enter one recipe, the ingredients, the ingredients I needed, the ingredients I had on hand...I could have saved twenty minutes of my life and performed the same task with pen and paper. This is the ultimate meal planning and recipe saving app especially with recent updates. I use this marvelous App daily, excellent for daily/weekly meal planning and for special event entertaining. I've entered our friends names as recipes and created a 'guest' category for them so I can keep track of what I've served and to whom, also special notes like allergies and preferences. I have used Mealboard for quite some time. There are some things I love about it and, unfortunately, many others that I absolutely do not! The fact is, though, that few meal planning apps have the features that are important to me, so I stick with Mealboard, even though there are times when it makes me want to throw my phone. The great part about Mealboard is that it lets you import recipes from all over the Internet and transfer the ingredients in thr recipes you plan for the week directly into your shopping list. Now for the cons: 1. Basic tasks can often be clunky and effortful. If I bought three dozen eggs last week, and I add eggs to my list again this week, it automatically puts three dozen on again. That memory feature is nice for things I buy in the same quantities each time I shop, but when I don’t, I have to manually scroll through my entire list of groceries in order to see the amount listed and change it. Very tedious! 2. The app likes to feast on battery life (to the tune of 70% or more of my phone’s juice just in the hour during which I am using it while shopping) 3. My husband and I share the shopping duties, but lately, the app has not been syncing properly between our phones. That means we often need to make multiple trips to the store each week to pick up items we missed because the app didn’t sync them. 4. We need a way to DELETE extraneous food entries. Thanks mainly to my many imported recipes, I have, to use one example, about 150 different versions of skinless chicken breasts on my list. From abbreviations (chix breast), to misspellings of various types (skinlesss chickens brest), to different ways of cataloging (chicken, breast, skinless). I realize that imported recipes will continue to add these variations, but could I at least have the ability to clean up my own list so I don’t have to scroll endlessly each time I want to add an item to my list. There are other features (the pantry, for instance) that I simply do not use because they are too cumbersome. I get that the developers want to provide options, but too many options often leads to an overly complicated app. I think that’s Mealboard’s main downfall. Just started playing around with this app and I love love love it! You can import recipes from the web even favorites from Pinterest by copying the recipe link. There aren't many apps out there for meal planning that let you add your own recipes this easily. I like that you can import a recipe from online and then adjust it. The shopping list feature works great. I like that you can update the recipe to not add common ingredients to the shopping list. There was some weirdness around the shopping list after I edited a recipe until I figured it you have to resync the shipping list. Good feature but hard to find. I can't believe I paid $4 for a phone app but it's very useful. I just started using the app and I have high hopes for it being the meal planning / kitchen organizing app I always wanted to have. But there is one big reason why I’m not using it very much: importing/inputting recipes to MealBoard is a huge put off when compared to my current grocery/recipe app: AnyList. 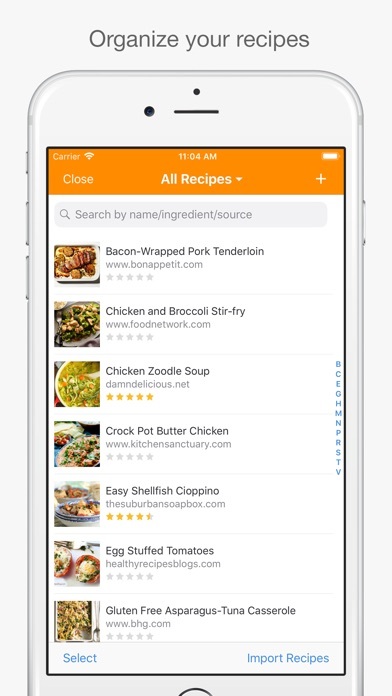 AnyList is near perfect at importing recipes and super easy because it ads a share-menu command to Safari allowing 1 -tap entry of on-line recipes. No need to copy and paste URLs. It also does an amazing job of parsing recipe data that is pasted into the app. So it’s super easy to copy an emailed recipe and paste it in. I can also use the Mac version of AnyList to more quickly type in recipes. But AnyList does a horrible job of creating a grocery list from more than one recipe. It also does not have the ability to enter and keep track of items in the pantry. And right now their devs are adding stuff I really don’t need or want (Alexa integration) instead of improving the functionality of it. That is whyI really want to use this app as my only Grocery/Recipe app. But until getting the recipes into this one is easier I’m still using AnyList everyday and putting MealBoard on the back burner. I was looking for a way to list out family dinners for the week and got so much more! To be clear this app requires some setup time but in the end is totally worth it. My main problem with other meal planning apps was that the recipes were either too gourmet for my kids or chosen for me. MealBoard, on the other hand, is a powerful blank slate! It has a few recipes to get you started but I deleted most of them since the dinners my family will eat are pretty basic. MealBoard lets you easily import any recipe from any website to build your customized recipe list to choose from in the future. MealBoard is the perfect custom recipe box / meal planner / shopping list / ingredient tracker all rolled into one. Seriously I love this thing. I usually use Pinterest recipes, so I love that I can import the recipes from each website (and not have to scroll to the bottom of the blog each time)! It’s got everything I want and more. Satisfies my organization-desiring side. GET IT. Worth every penny and more. I use it daily. Thank you. I use this app to keep track of all household items. It is much more than just a meal planner. Makes shopping a breeze. I love it! Coming from a Galaxy Note 4 using The Grocery Tracker app, I’ve tried many meal planning/shopping list apps in search of an iPhone equivalent and this is by far the closest I’ve found. It takes a little bit to get it set up, but is easy to use once done. The only thing I wish it would do is give me the ability to set store specific aisles and not have to wade through all of the aisles I have created to assign them to products and stores. At least the ability to filter the aisles by store. Other than that, I am completely satisfied with this wonderful app. I had to replace a certain app that sold out and gave up functionality as part of the deal. Enter MealBoard. Now I don’t even remember the name of that app. This app is fantastic. I am able to load recipes from WW and import from other sites easily . The shopping feature is so customizable, I have it set up my favorite stores. I love the features of this app. Very easy inventory management and recipe handling which were my two most important features. I only wish that the inventory tab sorted your items by category instead having one massive list of everything. You are able to easily search this list butI like to keep things organized, and one giant list is just not orangized enough. That being said, all the features in this app are well developed and I would definitely recommend this app! The best feature is the recipe section-being able to import straight from online is extremely helpful and easy to do. Takes a while to get used to it, but then ... wow!!! I started using this app after tons of research because the last one I was using was not compatible with the new updates. I really like it and it is very clean and user-friendly. Organizing my weekly menu is easy, as is creating my weekly grocery list. The biggest problem I see with it is that many, many websites cannot be imported into the app. There are lots of popular recipe sites now and I would like to see the developer allow for a wider range of recipe compatibility because it gets frustrating. If that wasn’t an issue, I would have easily given it five stars but it’s kind of a big deal. I really love this app! It takes a little work on the front end but once you get it set up it helps a lot. You have to input recipes, so you can use it as your recipe book as well, though I just put in the name and ingredients. This takes the most time. But thereafter it’s just checking the list. Plop what you want to make that week and then create a grocery list! I find it has greatly reduced the amount of unused food going bad in my fridge. I do not use the supplies list or coupons. Those features to me require too much work to maintain. Especially when if I want to see if I already have green beans all I have to do is open the freezer. But you don’t need to use those at all and it’s fine. Thanks to the developer for keeping this app updated, and thanks for all the hard work poured into the app. Mealboard is a regular fixture in my kitchen, used for everything from pantry management to recipe scaling to shopping list creation to, yes, meal planning. Thanks, again! What a fantastic app! I have been using it for about 1 1/2 years now and I don’t know how I lived without it! So worth the nominal app fee. Over the first 6-8 months, I slowly added recipes as I made them but I made it last winter’s project to get them all added...1900+ in total. This app saves time - no lost time trying to decide what is for dinner tonight and quick assembly of your shopping list. I love being able to access from anywhere: my phone on the go, my iPad in the house, my laptop for recipe entry. My family can even check what is for dinner and add meals they have been craving. There are very few issues, if any, but on the rare occasion an external website changes and recipes can no longer be imported properly, support is quick to respond to the report and resolve. The only thing I would like to see in the app is the ability to save a favorite meal (main and side combo). There is a template to save a weeks worth of meals but I’d like to be able to drill down a bit further. Once I learned how to use the import feature I was unstoppable. As I await the birth of our daughter, I needed something to help end the “what should we have for dinner?” cycle. This app is the solution! 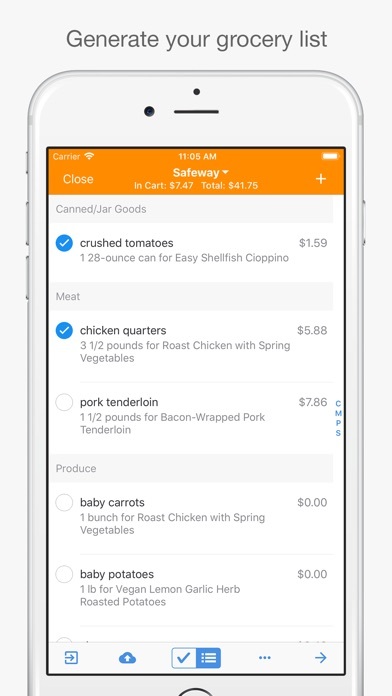 Now I know what the plan is when I get home from work, my wife doesn’t have to remember to take out freezer items because the app reminds us both, and it produces a weekly grocery list making shopping a breeze. Thank you, thank you! Saves time and super easy to import recipes!! Shopping list misses a few things and the aggregation doesn’t always catch everything, but really enjoying the app!! I’ve been using this app for more than 3 years. If you take the time to set yourself up with a bunch of recipes, you can quickly propagate a grocery list to work with. Honestly, I’m not sure how I would shop without it. Have used it for a month now, it really helps. I don’t totally understand how it decides what recipes to put in the “in stock” view though. I have been looking for an app you can track the grocery items you have with expiration dates & a shopping list with prices. This app checks all the boxes. It adds the items you buy to the pantry. Plus you can easily add recipes & move missing ingredients to the shopping list. This is the best all around grocery app I’ve tried. However, the barcode scanner doesn’t pick up Trader Joe’s items well. It also struggles if ingredients don’t perfectly match the pantry items. Loading recipes is a breeze! The units are a pain generally, but I think that’s true of all grocery apps it seems. What a disappointment. The recipe choices are a joke, with only 21 recipes. Am I missing something? I have committed to eating healthier and hoped this app would help me put together the menu for me, or at least have some idea where to start. For a paid app I really expected a more features. . . It provides an easy way to plan and cook dinner avoiding the kids “what’s for dinner?” since the meals are posted on ICal. I’ve been using this app for almost a year now. Learning its capabilities and how to use the app was a little difficult at first but now that I’ve learned what it can do and with the improvements implemented its really a great app. I recently used the shopping list for the first time and it made shopping for my ingredients so much easier because it tells you how much you need of each item so that you can buy the right amount. The absolute best part of the app is the ability to import recipes. At first the import feature didn’t seem to work so well or maybe is was the website from which I was trying to import but I just imported about 10 recipes this week and all imported fairly well. You have the ability to make adjustments or corrections to the imported recipe if needed. It will include a link to the original recipe so that you can easily go there if you want to see the original recipe website. I’m working on my Thanksgiving meal plan and recipes now. It’s definitely worth the price. I’ve tried a lot of grocery store apps and recipe apps but none combine the two better than this one. It’s super easy to use, you can sync so your hubby knows exactly what to buy, and it’s all inclusive with prices. I’ll never buy android because they don’t have this app available on it. Or at least they didn’t last time I checked. Well worth the $4.99 or however much it is now. Thanks! Mealboard does it all. I can input my own recipes, import from my favorite recipe websites, or use the ones already there. It adjusts for how many I’m cooking for, makes my shopping list, saves meal plans so I can use them again, and more. Only wish it was on Android. LOVE this app. After years of messy email recipe records I finally decided to get organized. This app is a dream for those who need a one-stop shop for recipe storage, meal planning, shopping list making, and general inspiration to keep cooking. It is easy to import recipes from the web (or manually type in ones you have printed). The app has worked reliably for me for over a year and I am thrilled with it. Highly recommend!!! The great circle, and pictures, too! This app has been a huge help for me in meal planning and recipe scaling. I love that I can take almost all my bookmarked recipes on my MacBook and import them straight into the app. To have my shopping list edited and printed out is just amazing. Very happy I have this app. I have used MealBoard for years and this app has worked flawlessly and has never let me down. I have set it up so that data is synced between my iPhone, my wife's iPhone and her iPad. She creates the meal plan and groceries, and I do most of the shopping. Very convenient for her (!) and it saves us so much time as we both work. We also use the pantry feature to manage our inventory. II helps us avoid food wastage as you buy only the things that you really need. This app is truly an all-in-one app I can't imagine living without it! It's intuitive, efficient to use and works very well (never lost a recipe). I've been using this app since 2011 and it just keeps getting better! It's so easy to import recipes and to do my meal planning and grocery shopping on the go. I work full-time, have a long commute, but want to cook healthy food every night for my husband and two kids. Finding this app has helped me stay organized with meal plans and groceries and keeps my family full! Literally obsessed with this app! Life changing! Started doing the Keto diet this week and I don’t think I could do it without this app to plan my meals, grocery shopping, and saving each week as a meal plan template for future reference!!! Highly recommend if you need some serious structure in your grocery and meal planning strategy! This app does everything I wanted and more. I can keep all my monthly recipes together in one place and make a weekly chart of my weekly meal plans. I love being able to scale down the recipes to fit my family count and change any recipe the way I want. Keeping my grocery list is a dream now and instead of printing it out and hoping I don’t forget to take it with me, I just take my phone out and open this app! I sync it with my iPad so I can access it anytime anywhere. Very user friendly and easy to use from the start. No complaints here! I recently started a diet for autoimmune management (AIP) in which many foods are eliminated, hopefully to be reintroduced when symptoms go away. It has been very overwhelming and time consuming. I had already purchased a great cookbook that came with several meal plans but I found it to be out of our budget, not the recipes I most wanted to try, and I couldn't keep up with the pace. I decided I needed an app that would allow me to enter my recipes into it, put them on a meal plan, and then enter the necessary ingredients into my grocery list. I found a few options and tried out two free ones, but one of them wouldn't let you enter recipes, so with my restrictions I would have run through the small selection available to me in a short time (plus my new cookbook would have been wasted), and then another one kept putting the directions into alphabetical order. I decided then that it was worth spending $3 on this one, which had good reviews and it does so much more! I can do all of the things I wanted to do, but also: -I can import recipes from websites (especially useful for a unique and restrictive diet like AIP) -I can log prices of certain groceries, how much I have in stock (pantry inventory! ), notes about the item, where I can purchase it, which aisle it will be in, where I can find it in the kitchen etc. -I can export to my phone's calendar. -I can set a reminder to tell me to tend to a meal -Entering ingredients on a recipe will let you put "chopped" separately from "garlic cloves" so that your grocery list doesn't Have 4 different variations of garlic cloves in it. In fact I could edit the grocery list and change 10 garlic cloves to 1 garlic head. -I can choose any 7 days of the week to start - like I could start my meal plan on Wednesday if I wanted, instead of Sunday or Monday. This is nice since I like to take Saturday off for rest, and have to be sure there is enough food to get through the whole weekend. I also refuse to shop on Saturday. -I can automatically scale ingredients so I always have the right amount. -I can categorize recipes any way I want. I haven't figured out what the coupon feature is, and I haven't used it long enough to use a saved meal plan, but those are also features I intend to utilize. Because of this app, I have easily been able to curb spending and food waste. I have been able to enter several recipes from my cookbook and from online, scaled them each to give me enough to last for 3-4 meals, and will now only have to cook 6 meals a week, 1 a day, save Saturday. I am still overwhelmed with this diet change (it was inevitable), but this app helps me to be so much more organized and relieves a lot of my stress. It is also easy to use. In fact, it is so good that writing this positive review (a rare thing) is what I chose to do while briefly prevented from sleeping in the middle of the night... clearly, sleeping habits will be my next hurdle to overcome. I used MealBoard a couple of years ago, but when we stopped following a strict diet I got away from using it, and just stored recipes in Evernote. Evernote has become bloated and slow and I am looking by for better solutions to a number of organization tasks as I go into the new year. Taking another look at MealBoard I am finding it much more polished and very convenient. Being able to import recipes in the iPhone and iPad apps, as well as on the computer is really nice as I almost always use my iPad in the kitchen. The shopping list app I have used for years is getting buggy so I am willing to invest the time into AIH a change. MealBoard has the features I use most and I like the list being generated from the meal plan. As I am shopping monthly I think this will prove useful. I am pleased to see the development that has occurred since I used MealBoard last and I look forward to incorporating it into my new year’s organization. Awesome app, the recipe import works very well. MealBoard has simplified my meal planning tremendously. Amazing App for College Students! I got a different meal planning app that was free but costed monthly (7.99) to get all of the recipes and I hated it, so I bought this app. Sooo much better than the other app! I love that I can import any recipe from websites, or create a new recipe from my old recipes or ones I find online. Also love that I can put what I have in my pantry on it, and it generates a shopping list. Great app for eating healthy, making family recipes electronic, and for grocery shopping. Also, you can go to mealboard.com and edit/add recipes and view all your recipes so they are always available! I've been using this app for years now and still love it! Very helpful and easy to use! I love the import features. Web interface is a bit clunky but does it's job and works well. This really has been a life changer! I have been looking for an app like this since the dawn of iPhone. I especially like how easy it is to move the ingredients to different categories to ease the shopping trip. You can find almost any recipe you search for. I’ve tried them all but Meal Board has no equal. It is the most perfect meal planner/recipe organizing/shopping list app ever created and more - sooooo much more! Serious life hack and saver. I can’t praise it enough. I know what I’m going to cook. I know when I’m going to cook it. I know what I have to buy. I know where to buy it and how much it’s going to cost. EXTREMELY PLEASED! This app is growing on me..
There’s only 15 recipes on this for $5. Wow. That was a waste of $5. I love this app. Everything I've looked for all in one place. I just purchased this app and I don’t think it was worth the four dollars I spent on it. My wife and I are in our fourth week of the keto diet. Week after week were flipping back and forth between their recipe book I have on my iPad and the Notes app. I thought I was getting an app that I could easily make a weekly meal plan and add the recipes I like. Nope, I can’t figure how to add simple ingredients to a recipe I have to MANUALLY enter. I try to add something like “shredded coconut” and it doesn’t come up in the list AND, I can’t click in the field to type my own ingredients in. What a waste of time and money. *** Could you please make it so we can text shopping lists? I really don’t know anyone who emails lists anymore, that seems a bit archaic already. The response time for help was less than 30 minutes! I wish every business was as good as this! I've been looking for something like this that actually works. Thank you! My husband and I both gave the app on our phones as well as the computer so we can sync when we go to the store. Typing my recipes in helps when I go somewhere and someone asks for a recipe. So easy to email it. Wouldn’t do without this! This app is an amazing and efficient way to plan your meals and populate a grocery list while doing so! It's a little hard to navigate at first, but with a little practice, you will be planning your meals months into the future! I love this app. It was just what I was looking for. I usually meal plan every week and it was starting to be a major chore. This app alleviates all of that. I have spent a fair amount of time up front, entering all my recipes and learning the app. It is very intuitive and easy to use. Once your recipes are in just plug them into the calendar and export your shopping list. It makes meal planning so easy. I starting using it to help organize our Whole 30 meals instead of using my disorganized spiral notebook. It has been wonderful. I highly recommend this app. Amazing app... as I’ve started using it more it’s useful features become more apparent. This app works great to just collect some of your favorite or harder to remember recipes however if you want to get more serious about meal planning, organizing your kitchen/pantry, eating healthy etc. MealBoard is great for this too. I love the fact that it’s very editable. If you have similar pantry entries it allows you to update them on the fly and then the next time you sync it updates your pantry and recipes. Very well designed and allows importing from all the popular recipe websites. This is all the further you need to look for a recipe/shopping app. I researched a while before going with MealBoard and it has met and exceeded every expectation. Could use a couple of tweaks, but overall I am happy with the purchase of the app and find it very useful. Possible improvements: -When using the recipe Import function, the in-app browser will freeze or fail to respond or load new pages. (I’ve only noticed this either budgetbytes.com website, and I’ve gotten around this issue by searching in Safari for recipes on the website and then copy and pasting the URL into the bar at the top of the browser in the MealBoard app import screen) -The app hasn’t automatically imported the prep and cook times for the recipes, despite them being listed on the website in the same format as the other information (like the number of servings) -I haven’t figured out how to view a recipe full-screen or to view the recipe image full size. -I don’t know if the app has been designed this way, but when on my iPad, I can only use the app in landscape mode, but I’d prefer to be able to use both portrait and landscape viewing methods in the future. These are small things, as stated, I really enjoy this app and appreciate its functionality. I highly recommend it, it is more than worth the purchase price. Thanks for your great app! This app works great!! I love being to add my recipes (some I had before there was internet) and save recipes from the web!! It's nice to have my recipes on my phone when I've forgotten to add something and I'm in the store. Worth every penny! Easily plan meals, import recipes, keep track of food inventory and formulate grocery lists! Plus you can easily email recipe requests and grocery list. Powerful app that integrates meal planning, recipes, shopping lists and pantry inventory. WOW!!!! How Great Is This App!!! I’ve been married and planning meals for almost 54 years and could have certainly used this! I’ve just downloaded MealBoard, listed what is available already, arranged my grocery shopping by aisles, figured out how to make a week’s worth of three meals a day, imported favorite recipes from Pinterest and printed out my menus for the week! This app is very helpful in meal planning. It takes some time to learn how all of the features work, but it’s worth the effort once you get the ball rolling. We’re still getting our pantry updated on the app but are very happy with it. Would recommend for those looking for ways to plan meals easily. I am trying to love this app but there are a couple glitches. Once I put a menu into place it leaves items in my shopping even if I delete a recipe and replace it with something else. I completely deleted a week menu and started over to try to take the items off the list but they came back with the new list. Also a couple of items needed for my menu were left off completely. I added cabbage rolls and the cabbage is not in my list. It would be helpful to have a tutorial or user section to explain how to use this. This app does almost everything you could need for managing your kitchen. Sadly, because it requires so much focus and data entry to really take advantage of it, we are disappointed that it does not meet our needs for shopping for deals. In our old grocery app, we can list prices per store, per weight, so that we know what good prices are. If we see a sale, we can tell if it’s better than the price we normally pay. Like a lot of frugal people (people who try to save time with meal prep by using this app) we shop at multiple stores for price and availability. Just what I’ve been looking for makes planning meals and grocery lists so easy! I’ve been using Mealboard for two weeks and am very happy with it. Takes some time to understand how it works and how to get the most out of it, but it’s worth the effort. I have no doubt it’s going to help me eat healthier and grocery shop more efficiently over the long term. I do wish some frequent tasks were more obvious in the user interface, such as a big button next to a meal saying something like “eaten” that would automatically update the pantry rather than the multi-step process today. And gray out or dim past days. Just a little more thought put into the UI design. But overall a fantastic app that’s earned its place in my top row. I have been looking to organize my weekly meal plans with existing recipes that I love as well as ones that I want to experiment with. You can import most recipes (strangely a few haven’t) and also rate them, add notes and modify the recipes. There are a ton of customizations available. I LOVE how the app extracts the ingredient list from the recipe snd puts it in a shopping list. It makes meal planning and prepping so easy. Definitely worth the cost. I wanted to love this app. But it won’t import recipes from several sites, most glaringly is food network. I am giving it 3 stars because the developer is responsive but when it came down to it, this is just too incomplete so I had to go back to Paprika now that they’ve released v3. I was hoping to scan quickly but for Trader Joe and store brand items from Publix I had to enter manually and photograph. This app is everything it says it is. The importing of recipes is simple with just one or two glitches from a couple of websites. It allows you to plan for a week, a month, or one day and generate specific grocery lists for a given period of time. I have enjoyed using MealBoard. This app helps me plan meals and takes away that “what’s for dinner” stress. I love the ability to recalculate for a larger or smaller servings - such a time saver! I love this app!! Easy to import and edit recipes or even add your own. I love how it syncs into a shopping list you can edit. And I love not having to search for recipes on different sites!! So awesome! This one is all it claims to be. I use all the features and am able to email recipes to a friends who either do or do not also use the app. My biggest difficulty with it is something I doubt anyone can do anything about: if 2 same ingredients are entered slightly differently, the aggregate grocery feature can't work. I've gone over my current recipe list and changed them to match for the sake of my shopping list. Using the web site to enter new recipes has made it easier to choose the same ingredient names that I've used before. Recently, I’m unable to completely sync the meals to my iCal. I get only some, or they don’t update at all. One of my favorite apps of all time and I use it multiple times per day. Update a few years(?) later: I love this app. Gives you everything you need without fussy subscription services. It’s all in one and worth every penny! — This app has it all...customer service is great too. This is the meal planning app I've dreamed of! Whether importing a recipe I have found on-line or entering an old family recipe—MealBoard helps me keep all of best of the best recipes. The import tool is amazing!! Every recipe you find on-line imports the recipe, with directions and photo. Super simple. Set-up a meal plan for the week or a party. Create a shopping list based on your menu—it’s perfect. I like the integration of recipes, meal planning, and shopping. I love this app! It is so easy to find a recipe and upload it to the app! Voila! All my recipes at my fingertips! It even makes the grocery list for you! In categories by aisles! We would never cook as many recipes as my wife and I do if it weren’t for this app. Easy to find and add recipes. Makes our shopping list for us. It really takes the not so fun part out of cooking. Thanks! I’ve had meal planners and recipe books before, but none as easy and helpful as this. I’m trying to lose weight again and it’s helping me stay on track! Worth the buy! I love to cook but hate to shop. This app solves my dilemma. I choose my favorite recipes from any website, and my shopping list auto populates by grocery store category. Shopping made easy! I’ve loaded over 200 recipes into this app with ease (some importing, some entering) and use it daily, mostly for recipes while cooking. When I do plan a menu ahead of time and use the grocery list feature, it is very handy. I email the list to myself and can check off the items in the little box as I go from store to store. No complaints whatsoever and a great price for the convenience of a curated set of no-fat, Whole food, plant-based recipes. When I had a question about a website not automatically importing the recipes, the support person fixed the problem immediately. The recipes can be emailed to friends and I appreciate that feature, too.